I’m a big fan of durability. If you take the time to choose a product, fork out the cash for it and then fall in love using it (or in this case walking on it), that product better be there for the long haul. Maybe that’s the polar opposite of our current throw-it-out culture, but we’re talking about home renos here. Don’t we want to fix it (or install it) and then forget it? Research claims that an engineered hardwood floor will last between 40 and 80 years. That’s a pretty long span of possible durability, but even the short end is still four decades. 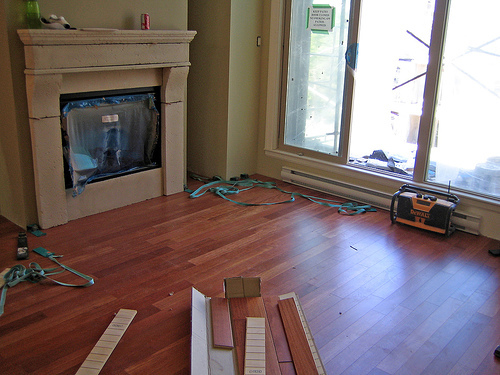 Other than traditional hardwood or ceramic, you’ll be hard pressed to get that lifespan out of another floor. This is where our tastes may differ. I’m perfectly fine with a few dents and scratches in my wood floors. It just gives the room character (and saves me from freaking out every time the dog rips across the floor.) But some people who are a little more particular may find that engineered hardwood falls short in this category. Just like traditional hardwood, engineered flooring will mar, dent, scratch and even chip if the force is strong enough. It does have to be strong or inflicted from a sharp object (um, a dog’s claw, for instance.) But if you have an office chair on wheels and weigh more than a Barbie doll, you can expect there to eventually be a mark in the floor. Repairs to engineered hardwood are possible and some brands can actually be refinished once. Kudos to the flooring industry for coming up with a hardwood flooring product that can be used below grade. Having real wood in a basement situation does wonders for your decor and atmosphere. But what happens over time with the humidity and moisture that’s common in basements? As long as the engineered hardwood is installed properly and has a moisture barrier underneath, it is made to have flex and movement. This allows the planks to take a fair amount of moisture. You still don’t want to dump your drink on it and walk away, but it is made to be durable in humid conditions. Engineered hardwood flooring gets an A for durability. It’s long-lasting in normal traffic, especially when compared to other flooring. Even though it will scratch and dent when force is applied, you can actually consider those marks part of the floor’s charm. Engineered wood floors will also take moisture, which makes them a good choice for the basement. Any way you slice it this floor is worth the cost and will deliver beauty over the long term.